Forklift extensions are fantastic for improving your forklift truck’s functionality, and at Pallet Trucks UK, we have a comprehensive range to ensure that we cater to trucks of all sizes and types. 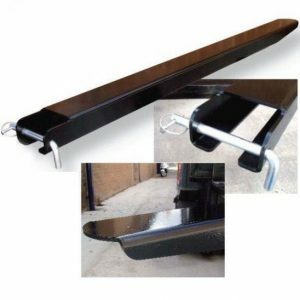 As always, our products are top of the range, but that doesn’t mean you’ll be paying top dollar – our unique combination of quality and low prices makes us the premier provider of this type of forklift accessory in the UK. Whether you simply need to add a few inches to your forklift’s existing forks, or whether you want to transform the capabilities of your fleet with numerous extensions of different lengths, we have the products that will give your forklifts a new lease of life. Our range of static electric lifting tables are the crème de la crème of the lifting world. Budget-friendly high-performance, and made from the most hardwearing materials available, each truck promises a lifetime of superb service that won’t break the bank. We stock a number of different static electric lift tables, from U-shaped units to electric lifting platforms with ramps to make loading and unloading quick and easy. Efficiency and boosted productivity are among the benefits of investing in one of these units, which are available from just £1,195.00 – as is the way at Pallet Trucks UK; superb value for money on every truck. If you’re unsure of whether you need a static electric lift table, or you need to chat about any of our products, get in touch with our friendly team, who are sure to point you in the direction of your ideal manual handling products.